1257 Oregon St., Redding; 530-768-1034 www.woodysbrewing.com S infully good beer, a top-notch pub menu and fun atmosphere make Woody’s the place to go for a good night out. From wheat beer to amber to whatever head brewer Pat Wlodarczyk can dream up, Woody’s is certain to have something to whet your whistle. And Woody’s was also part of the group to brew the Shasta Strong IPA to help with Carr Fire relief funds. The best Lounge in Redding by far. Here at Fusion Lounge, we do American food with a Southeast Asian Twist! Whether it’s a Thai, Mien, Laos, Vietnamese, Japanese or Korean twist, there will be a little influence from one of these cultures. Our food is very flavorful, unique and a blend of east meets west. We have weekly specials usually beginning on Wednesday or Thursday, and we will only have the item will supplies last! If you’re in the mood for something different, please feel free to come try us out! All our sauces, broths and ingredients are made daily fresh and original! We also have Southeast Asian infused drinks as well! You won’t be able to find food like this with 150 miles from here!! Hope to see you soon! Fusion Lounge Bar & Grill opened in Jr’s place. The premise is a new one for Redding: fusing elements of Asian cuisines (Lao, Thai, Vietnamese, etc.) with American and Mexican dishes to create such hybrids as the Pho-rito, Pho-nudo, and the Senganator Burger, while also functioning as a neighborhood bar. Despite their new sign, it’s easy to miss east on Hartnell, lost in a sea of metal auto repair and machine shop prefab buildings. The parking lot is one of those long narrow ones that pass by a long row of metal doors behind Fusion, makes a U-turn, and sneaks back out to Hartnell. Fusion’s black and blood-red concrete block walls, easy-clean tables and floors, and a goth restroom took a note from the punk club playbook circa 1976, but the clientele was a mixture of locals, auto shop employees, hipsters, and families. (Note: family-friendly until 9:00 PM.) There’s a pool table near the back and a smoker’s patio out the side door. 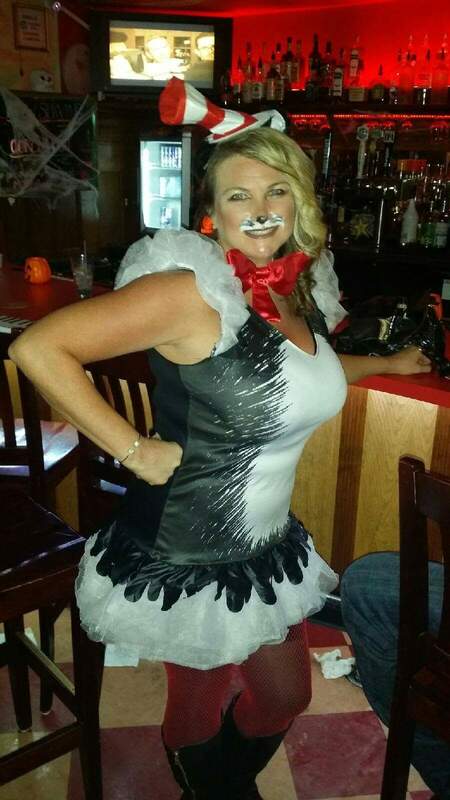 Sit at the bar or one of the tables and wait staff will take your order. Service was friendly and relatively fast; servers are knowledgeable about the food. Specials are on a backlit writing board at the end of the bar. 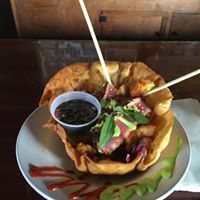 The concoction was a refreshing mixture of a taco salad with crunchy mixed cabbage salad, deep-fried shrimp, and tataki of tuna, Sriracha and wasabi drizzle, and a soy dressing on the side. The tataki (seared ahi with sesame crust, thinly sliced) was so very much like fine filet mignon that only its tendency to melt delicately on the tongue belied its origins. Alongside were crunchy fried shrimp that made a nice contrast to the pleasant and light tuna. The soy dressing, however, proved to be very salty, and toward the bottom of the cabbage salad, M. de Joie regretted pouring the dressing over. Sriracha and wasabi were fun to smear the shrimp in, but mixed on the plate they tended to look septic. Jason ordered Fusion Shrimp but what came to our table was Fusion Fries, as she discovered when he couldn’t find anything but chicken in the toppings. 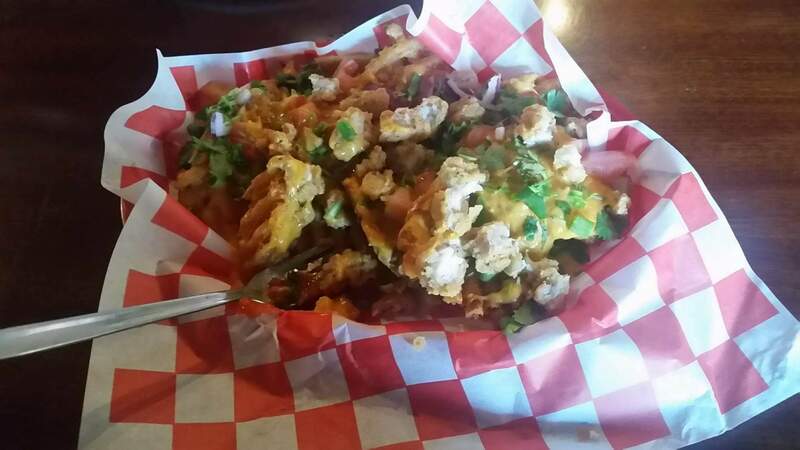 A variation on nachos or potato skins: Jo-Jos – seasoned crunchy potato wedges – were topped with melted cheese, shredded chicken, cilantro, diced tomatoes, Jalapenos, and Fusion sauce. Fusion sauce is a somewhat spicy, smoky red sauce with hints of Thai curry – think of it as an exotic fry sauce. It was quite good when first delivered, but after fifteen minutes or so, the potatoes got pretty soggy. This was plenty to share among two or three people. Calamari is a popular appetizer in restaurants, but it is almost always straight out of a frozen box, already breaded and ready to deep-fry and serve up with “our garlic aioli.” Fusion’s salt-baked calamari was delightful: thick bite-sized morsels with a dusting of tart tamarind and garnished with fried green onions and Jalapeno slices; this was addictive and original. M. de Joie had never heard of Kaliang Fin and cannot find any reference to it elsewhere, so it may be an original specialty. Korean flour made from mung beans is cooked with water, cooled to produce a gelatin-like block, then cut into small pieces and served in a cold and slightly sour broth. The gelatin cubes had the texture and taste of hard-boiled egg white, slightly sulphuric and bouncy. The broth didn’t have much personality other than tartness and seemed to be mostly a vehicle to support the mung bean jelly. On the side was a small amount of house-made fermented bean & chili paste to mix into the soup – the paste was spicy-hot and delicious, though didn’t think it helped the soup much. KF (as it’s called on the menu) did have a refreshing quality that might be appealing if one had overindulged in too much delicious food and drink. This towering burger, piled high with lettuce, tomato, onion, bacon, roasted eggplant, Fusion sauce, and a fried egg, was in no way reminiscent of a franchise burger. Goopy and drippy, the thick burger fell apart as the egg yolk, and Fusion sauce disintegrated the bun and was overall luscious, juicy, and a wildly delicious messy mixture of tastes. Garlic fries on the side were on the greasy and slightly limp side, but Femme de Joie loved the plentiful garlic bits. In an unlikely location far from the main hubs of Redding, Fusion is trying out new and exciting ideas, and for the most part, they work. The menu is wisely kept small and manageable, with weekly specials thrown in. Prices are more than fair for the amount and quality of food. Though there were a few missteps, overall Femme de Joie loved the intent and direction of the kitchen. 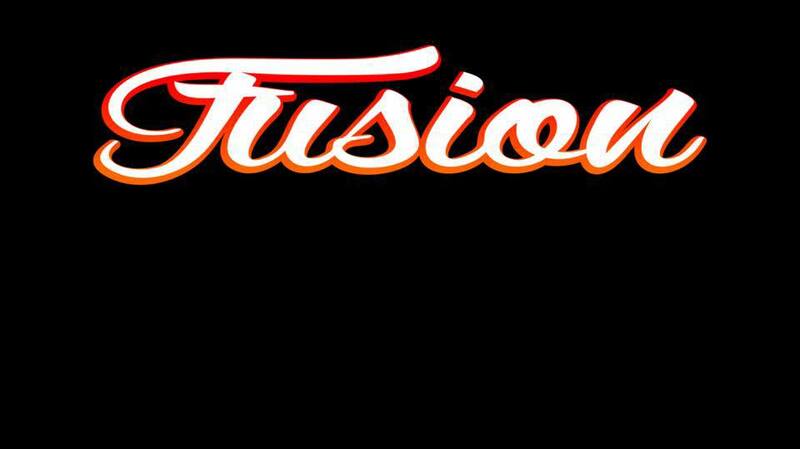 If you’re looking for something new to try, drive out to Fusion and sample their innovative dishes. Not sure what kind of scrubs are running this place…? ;-P But whoever it has this place on point!!! 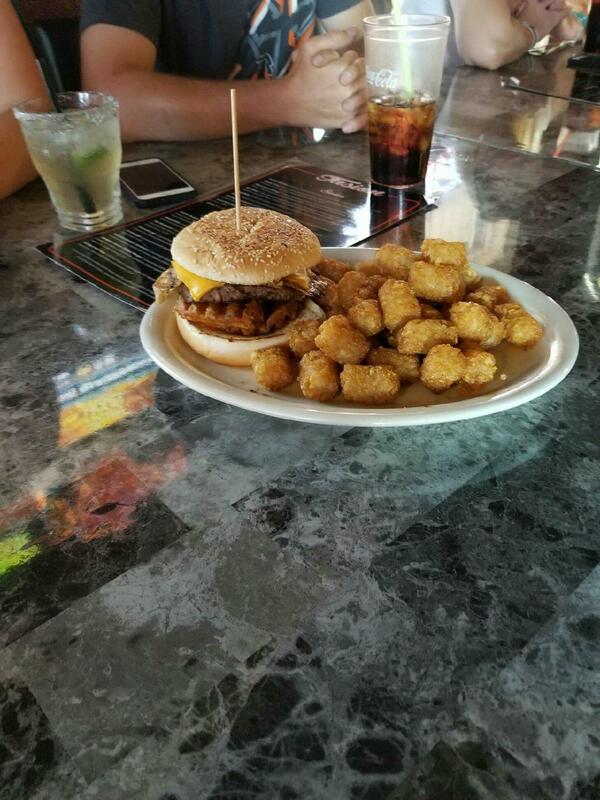 The BEST bar food in Redding’s hands down! 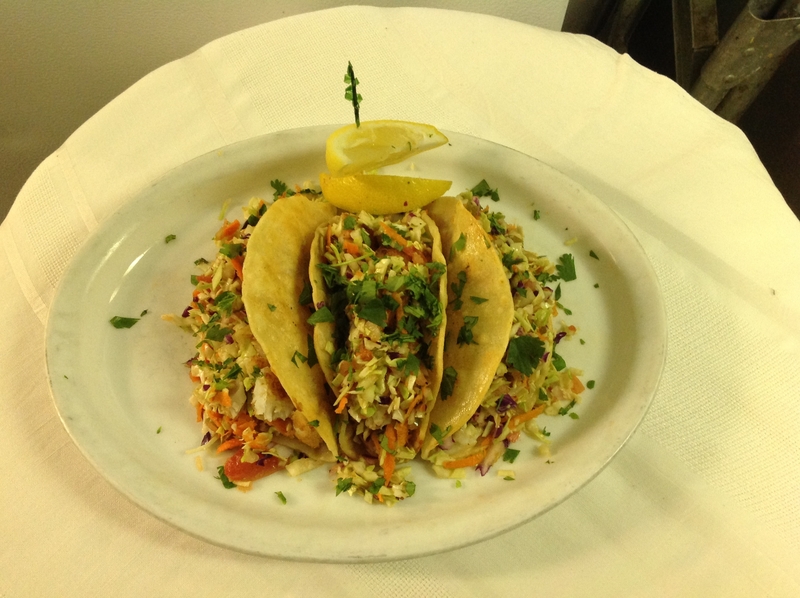 Their fish tacos are out of control! Not to mention some of the best services you will find! Do yourselves a favor and try this place out ASAP! We ordered ahi lettuce wraps, Calamari, and fusion Nachos. Everything was excellent especially the calamari. The beer selection was good if you’re an IPA fan I am not, but the food made up for it. Sorry I didn’t try this place sooner and can’t wait to go back and try other items. The place sets off of the east part of Redding just down the street from the hen house. Looking for something different than your standard cafe/pub food this is the right place. A blend of Asian and Western food dishes. Fries are tasty; the fusion burger is a must try. Haven’t tried the Pho yet, heard it was good from friends. 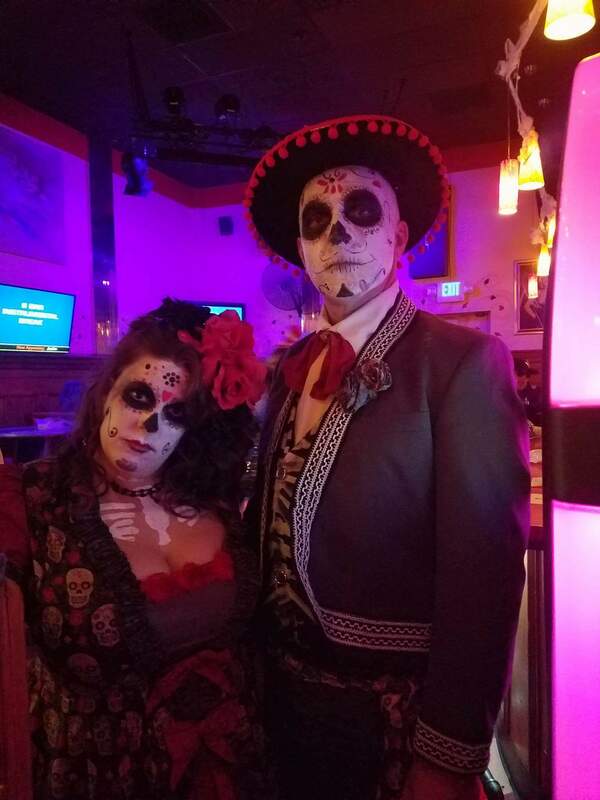 Excellent food, uniquely prepared and served in a dive bar atmosphere and the prices are great! 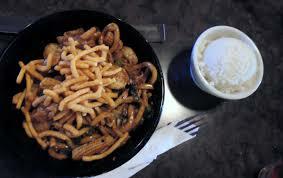 Kahunas Mongolian BBQ is where you can create your custom-made stir-fry by choosing your ingredients and sauces. Interact with their grill warriors as they prepare your meal right in front of you. So much flavor and Kahunas has something for everyone, from vegetarians to meat lovers and even gluten free diets! And of Course they didn’t forget about the kids; they can enjoy Kahunas also with child menu pricing of $4.99 a bowl. Add a roll of Sushi to your table with your stir-fry and a refreshing cocktail and your dining experience is complete. At dinner, you will be able to enjoy your choice of, lamb, shrimp, mussels, beef chuck, chicken, pork loin, and bacon, plus all the fresh vegetables and Delicious buckwheat noodles!! At lunch, meats are: Beef, Chicken, Bacon, Pork but the seafood can be added for an additional cost even at lunch, ask your server for details. You will have your choice of white or brown rice. They are Locally family owned and operated and open seven days a week. Gift cards available for those unique and yummy gifts! Nina said while talking about the experience; she has been in the restaurant business for over 40 years. From hostessing, serving, bartending, kitchen, management, to restauranteur. Kahunas offers 20 different homemade sauces, a buckwheat noodle, bacon, dry spices to get a delicious plate of food. They are now also offering sushi. Not only do you get so many different options and the variety of foods, but you also get the chance to be a part of making it, customized to your desired taste, and made right in front of your eyes! 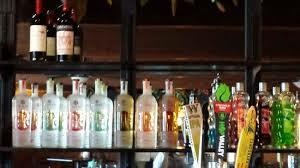 Kahunas has six different beers on tap: We have a vast variety of bottle beers also. Enjoy a cold bottle alone or in one of our special buckets for additional savings. Our unique wine list we have created, whether it’s a red or a white, may be enjoyed by the glass or bottle. We also serve Soju Tequila, Vodka, Rum, and Gin; this allows us to create some amazing, tasty, tropical. Signature cocktails. It would be our pleasure to help pair your beverage with your food. What is The History of Mongolian BBQ? Khan and his Mongolian warriors would make camp and prepare lavish feasts. Using their swords, the warriors would prepare slivers of meats, combined with whatever vegetables and spices on hand. They would grill them on their upturned shields over a blazing fire. This type of cooking has become known the world over as Mongolian BBQ. With this tradition in mind, Kahunas Mongolian BBQ brings you the ULTIMATE MONGOLIAN BBQ! Redding was missing a Mongolian BBQ at the time, and the Oller Family wanted to open one with an American Style. On April 06, 2014 Kahunas had their Grand Opening! Friendly Service, Relaxing Atmosphere and with a vast variety of homemade sauces and fresh vegetables, noodles, and rice. Kahunas always promotes education and healthy eating and proud to offer all College Students that bring their ASB card in at dinner time a $2.00 off discount on their entree. Saturday 11 am to 9 pm. With humble beginnings, starting each morning before the sun rose into the sky – in a little, vermin infested, old, rickety building, tucked away on Main Street in Woodland, California – Chris Collins, along with his partner, Mike Reynolds, created entertainment and radio magic. From this shoe-box of a studio, sitting atop a bank, next-door to the neighborhood watering hole, Collins and Reynolds molded a high-schooler, a local barfly, the over-night FM 102 jock, an auto part salesmen, and rounding out this motley crew – the only woman on the show – a voice talent from LA; into one of the most popular and dynamic morning radio shows to ever hit the Northern California air-waves. The public was totally caught unaware as, Chris Collins, the Ringmaster of this band of Zoo critters, pulled crank bits and played pranks on their unsuspecting public. Much beloved bits like: Toss Your Boss and Burn Your Buns, became the bread and butter that had their audience eating out of their hands and craving for more. And Collins and Reynolds delivered them more; by bringing in star guests, like Richard Simmons, or musical legends, such as the Jackson Five – into the homes and lives of their avid listeners. The Morning Zoo reigned supreme from 1983 until 1992. A host of characters came and went from the studios that started in Woodland and ended up near the fabled – Howe About Arden area of Sacramento. The characters, bits, guests and artists were interchangeable, but the mainstays: Chris Collins and Mike Reynolds stayed and became house-hold names and etched their names into Sacramento Radio history; where they have remained legends to this day. But their story hasn’t ended; in 2010, Chris Collins and Mike Reynolds, reached out to founding members of the Zoo – Robbie Lipelt and Gary Moore; and also Killer Bee, who joined the madness in 1987; to reunite the Zoo. Helping to bring the reunion together was, Mark McGee, the Program Director of several Chico based radio stations, who lent his support and the studios for the newly formed Chris Mike Zoo show. Recording began in January of 2010 and has continued to this very day. Through the help of technology, determination, grit, character and insanity – the Chris Mike Zoo show is being heard 24 hours a day, 7 days a week via the Internet or through our free cell phone Apps. The show is a worldwide based Entertainment entity. Our new numbers show a steady increase of the variety of countries, ethnic groups and races that are becoming loyal Chris Mike Zoo fans. Comedy is universal and laughter is the commodity we deal in. 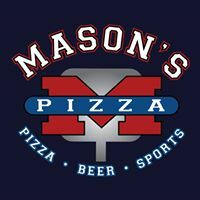 Great food and tasty acoustic music from local musicians await you at Mason’s Pizza in Bella Vista. Mason’s offers a family-friendly atmosphere, so bring the kids. 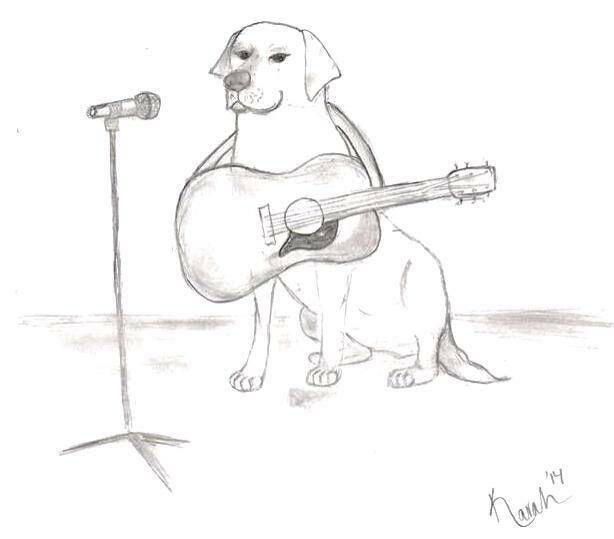 Would you like to perform? Just bring your instrument and three or four rehearsed songs, and we’ll provide the rest. No cover. Hosted by Deschutes Music Club. Stand Against Stigma and the Community Education Committee are very excited to present Hope Is Alive! 8 at Carnegie’s. Has creating music, rhymes or poetry given you light in dark times? Or shed light on a hidden struggle? Then come celebrate how art heals. Spoken word artists, poets, rappers, country/western singers, dancers, any and all performers are welcome! Performer sign-in is at 5:30 p.m. The Hope Is Alive! Open Mic Series are events organized by the Community Education Committee and the Stand Against Stigma campaign to raise awareness about mental health struggles, substance use disorders, and suicide loss. We strive to use art and performance to fight stereotypes and promote healing and understanding. Hope Is Alive! is an inclusive event – People of all faiths, ethnicities and sexual orientations are welcome and encouraged to participate. For more information, contact Marc at mdadigan@co.shasta.ca.us or 225-5970. Crafts, Small Business and hand made goodies! 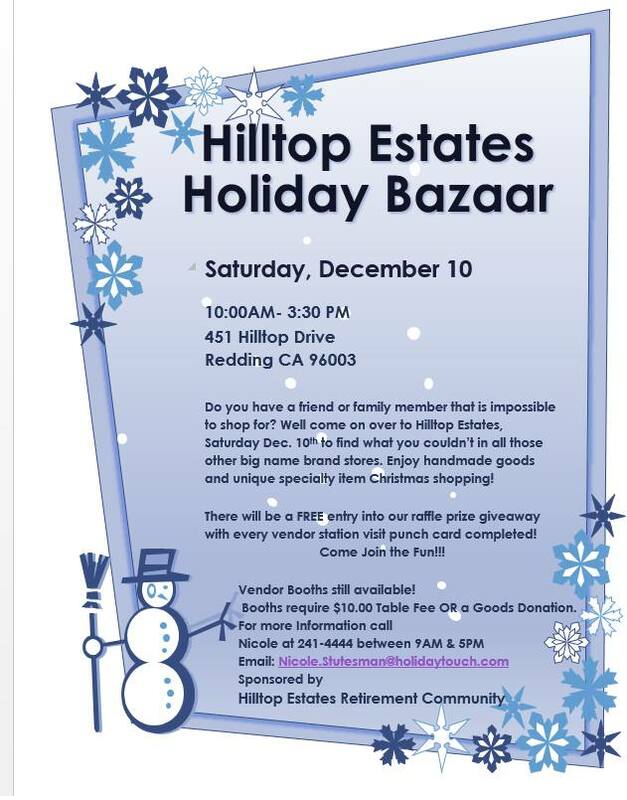 Come Join our Communities Holiday Bazaar! Call 241-4444 to reserve tables! 3 table max! We have in house tables! This Halloween, AAA reminds motorists to travel safely and Drive drug- and alcohol-free when hitting the roads. For those who do plan to drink, AAA urges them to take safety precautions in advance: designate a non-drinking driver, call a cab or stay with a friend. Sideline is a powerful group of seasoned pros which has been getting busier and busier since this “side project” became a main gig for its members. Sideline consists of Steve Dilling (banjo), Skip Cherryholmes (guitar), Jason Moore (bass), Brian Aldridge (mandolin), and Nathan Aldridge (fiddle). As the name suggests, Sideline intended to be a sometime band, but the success of their debut album made Sideline a main line. Sideline captures so much of what was great about bluegrass in the 1980s and early 1990s. In large measure, Sideline serves up what was contemporary bluegrass thirty years ago. It sounds traditional in 2015. Sideline’s driving bluegrass with killer harmonies and propulsive rhythm, well-chosen blend of new and old material, and especially the focus on being an equal ensemble takes the listener right back in time to when these guys were jamming in the campground. These musicians all speak the same language. Steve, Brian, and Jason all come from the same area, went to the same festivals, picked in the same jam sessions, and heard the same bands. California-born guitarist Skip Cherryholmes spent 13 years with his family band before choosing to become a North Carolinian. Aldridge’s 16-year-old younger brother Nathan has since joined the band on fiddle. This band enjoys playing together and projects just that on stage and in recordings. Okay, so this has nothing to do with comparing a pancake smothered with peanut butter to one of the Best Of The North State microbreweries, Woodys Brewing Company. A quick overview of microbreweries first. Microbrewery growth especially in California has boomed. Who would have thought that out of all the states California is the number one American crafts beer capital with Washington being second and Colorado being third? As of 2014, there were 3,418 craft brewers in the U.S., an increase of nearly 20% over the year before. Craft beer production rose 42% last year, and for the first time ever, craft brews accounted for more than 10% of all beer sales in America. Woodys Brewing CO was in that 3,418. Why Woodys Brewing Company Beats Peanut Butter On Pancakes? Had a friend tell me about this place several months ago and was anxious to do a shout out about it especially since I’m a serious foodie guy that loves writing about the food, drink and entertainment industry. You could say I’m La Cafe News. When a musician friend from Sacramento and I pulled up we were amazed at all the vehicles parked in front of the establishment. “This is good a good sign” I said out loud. When walking in we were greeted with the soothing sound of chatting people. When seated we noticed how simple and streamline the menu was designed, the video explains this. Decided to order the Fish & Chips or should say Fish & Tater Tots. When taking the first bite of the lightly battered fish you knew this was no frozen fish, we’re talking extremely fresh. The crispy freshness was matched with a bite out of the tater tot; I have to say, this by far are the best tater tots I have ever had in my life. The tots are made from scratch and the outside of the golden brown crunchy skin is garnished with medium fresh garlic, kaboom baby! Scott one of the owners out of three and the hostess explained that everything is made from scratch and the chefs work together to achieve the ultimate foodie experience. Could go on about the whole foodie experience and ambiance at Woodys Brewing Co but drinking their sampler of micro brews was a real pleasure. How can you say one was better than the other when they were all good? I compared my dire straights like playing that Chucky Cheese game beating the gophers over the head as they randomly popped their head up through the holes and you tried to bang them with that bulky soft mallet, which one which one? Redding Reviews and Best Of The North State will be doing another shout out on this amazing local business in the near future and their vision. Writing about their vision and goals is another editorial in itself but have to say the residents of Redding CA and NorCal are in for a big surprise. Until next time, hold the peanut butter on those pancakes! How Nostradamus Predicted Shameless O’Lerry’s Success. No, Really! 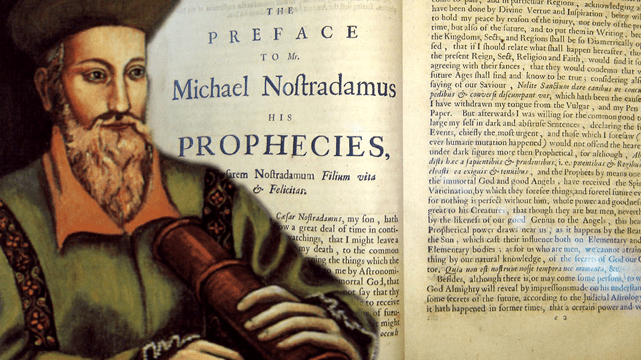 How Nostradamus Predicted Shameless O’Lerry’s a Success. No, Really! 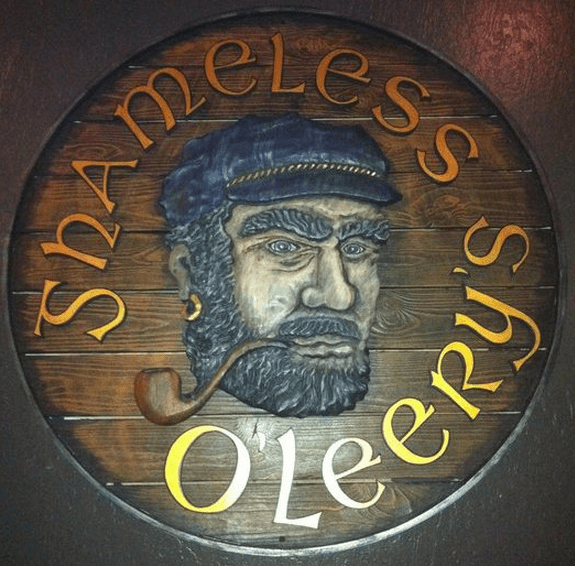 Some believe Shameless O’leery’s is one of the biggest success hits in NorCal. Rightly so, they have an Irish themed sports bar and restaurant that is second to none. Okay, maybe the Nostradamus prediction might be pushing it but when it comes to celebrating St Patty’s day there are only a handful of places that seem that was created for this yearly religious and cultural celebration, Shameless being one of the things to do in Redding CA. What is St. Patty’s day? One of the, worldwide religious and cultural celebrations done every 17th of March: St. Patrick’s Day or St. Patty’s Day. Celebration of this day has become a tradition for many countries including the United States. This is to celebrate the most acknowledged patron saint of Ireland, St. Patrick, whose death is known to be this day. St. Patrick is said to be from Roman Britain, born from a wealthy family. Most of what’s known about him is derived from the Declaration. It is believed that St. Patrick himself wrote the Declaration. He became a slave to Gaelic Ireland when he was 16 and spent six years as a shepherd. According to the Declaration, God told him to go to the coast and a ship will take him home. He became a priest after making his way back to his home and eventually returned to Ireland to convert pagans to Christianity. It is also believed that he banished snakes from Ireland after being attacked while he was fasting. St. Patrick’s Day became an official feast day for Christians in the early seventeenth century. The Catholic, Lutheran Eastern Orthodox and Anglican Communion churches observe this feast yearly. The United States started its participation in celebrating this feast in 1737. Participants of this tradition, including restaurants and pubs in the United States, wear shamrocks which are believed to have been used by St. Patrick to explain the Holy Trinity. Green clothing and accessories are also worn during this feast. Bagpipers are also a common view during this celebration since Ireland is known for its great bagpipers. And because this feast celebrates Irish traditions, pubs and restaurants in Redding CA offer green colored beverages and celebrate merrily with bagpipers. Restaurants also participate by having green as their color for the day and join the parade for St. Patty’s Day. And since this is an Irish tradition, restaurants in Redding California offer traditional and Irish inspired menus and drinks which you can savor with your family and friends. Here are just some of the hot spots to visit on St. Patty’s day.